Chandigarh is a city & a union territory of India. It serves as a capital city of two neighboring states, i.e. Punjab & Haryana. It is situated in the northern part of the India. Chandigarh city is not part of these two states. It is directly governed by the Union Government of India. This city is well-known for its education in the sector of engineering. There are numerous educational institutions which offer engineering courses in various disciplines. The average literacy rate of Chandigarh is 86.05%. 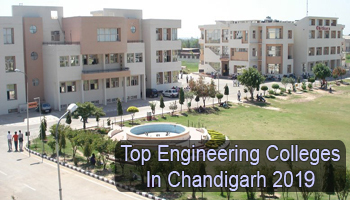 In this article, candidates can get complete information about Top Engineering Colleges in Chandigarh 2019. Here, we have listed the top engineering colleges in Chandigarh. Through this list, candidates will select the best engineering college for themselves. In this state, there are so many government & private universities/institution which imparts B.Tech (Bachelor of Technology) course. We have rated these colleges on the basis of several factors such as national importance, affiliation & accreditation, infrastructure, feedback of students, previous year placements records, faculty ratio, facilities provided by the colleges, etc. All the engineering institutions located in Chandigarh state will offer admission to the B.Tech programme on the basis of JEE Main score. It is a national level entrance test which is organized for admission to the B.Tech & B.Arch Courses. There are also some universities which conduct its university-level exam to provide admission into engineering courses. On the basis of GATE scorecard, candidates will get admission to the M.Tech programme. In Chandigarh, there is a huge craze for engineering education. Candidates can pursue B.Tech programme in various specializations. The top-rated specializations are Mechanical Engineering, Computer Science & Engineering, Electrical Engineering, Civil Engineering, Aeronautical Engineering, Electronics & Communication Engineering, etc. If you have any other doubts about Top Engineering Colleges in Chandigarh 2019, you can leave your query in the comment box.